A spoiler warning: this review is going to discuss the film and its plot and that may give away the story, if you haven't already read it in the papers or guessed it by the promos. For an unspoilt opinion, skip to the second last paragraph. Ravi Chopra is a filmmaker of the old school. He still believes in getting the basics in place - songs as narrative supplements, light humor for pacing, sharp editing, and understated performances. There is nothing about Baabul that makes it stand out as an auteur's masterpiece, but as closely as it follows the template set by Chopra with Baghban, it still is something that could have only come from him. Baabul is an important film for the trade right now. The previous venture by Ravi Chopra, Baghban, was the sleeper hit of 2003, and that makes this film a hot property as far as the trade goes. Add to it the fact that this is the first major Hindi release after Dhoom 2, and that makes the film very closely watched, indeed. 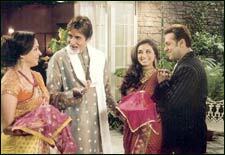 Comparisons with Baghban are only fair as, in a season of sequels, re-casting the major players of Baghban, with a similar visual language and repeating the social theme, lends this family tear-jerker something of a familiarity. The comparisons might not hurt the film too much as Chopra knows what he talking about in his films. His characters may be nice, pristine versions of our world and tend cry a lot, but he still understands the social fabric underlying them. It's just that his treatment of this societal milieu tends to belong to the old-fashioned mold. Each generation of people is less hung up on morality and tradition than the last, and he gets that. So we have an older brother Balwant (Om Puri), who is a stickler for the moral code book, and younger brother Balraj (Amitabh Bachchan), who believes in doing the right thing, even if it tends to be uncustomary. When his son, Avinash (Salman Khan), dies in an accident, Balraj decides to give daughter-in-law Mili (Rani Mukherjee) another chance at rebuilding her life, by encouraging her to see childhood friend Rajat (John Abraham). There are subtle references and allusions to what the film is going to serve up in the first half throughout, but it largely restricts itself to fleshing out a love story between Avi and Mili. Problem is, Chopra is ill-at-ease with all this romance-shomance. His father-son relationship and the purported wooing of Mili by Avi seem forced at times, and despite trying his best to be convincing, it never fully gathers any body. Salman bravely tries to rescue the needlessly heavy courtship with his usual tomfoolery, and it is thanks to him that most brevity is sundered. In Baghban, Chopra gave a song to the leads, and then came straight to the point - that of the children not having enough time for their parents. But the actual topic of Baabul - widow re-marriage - begins only after the first half. This not only makes the first half irrelevant in most parts, it also makes it hollow and undeveloped, as there are not enough characters to keep on introducing, which would generally be the role of the first act. Speaking of the topic of the film, it may seem terribly anti-progress and clichéd in this day and age to talk of such old concerns, and true enough, Chopra does depict it as having a lot of gravity, one reserved for more heinous troubles than something that may seem like good common sense to us. On the other hand, that is his deft sleight of hand as well. In creating a sugar sweet world full of gracious, rich people with old values and customs and a stunted viewpoint, he manages to talk about widows and their plight in normal households without any reserve due for a more sophisticated audience. This makes his point come across to all members of the crowd directly, and without beating around the bush. Full marks to him for keeping all the necessary melodrama in check, then. The second half is surprisingly tight, and keeps the narrative focused on small vignettes that lead to the final inevitable showdown with the custom heavy older brother. There is a lot, and I mean a L-O-T, of rona-dhona, yes, but all of that is punctuated with character moments with some very reserved and understated performances that keep things from going overboard. This is an Amitabh vehicle out and out, and he outdoes himself with a truly nuanced and subtle performance of the brave father-in-law with grace and poise. Never once do you feel overburdened with the emotions as he manages to lend a certain air to the proceedings that make it impossible to be over the top or maudlin around him. Rani is the female lead here, and make no mistake, this is her story as much as Amitabh's, and she is reliable to turn on the histrionics as needed. Puri could play a cantankerous old man in his sleep now, as could Salman play the cool dude, and they do what is expected of them. The grouse here is John, who seems bizarrely out of funk, and except in his scenes with the kid playing Mili's son, he doesn't seem natural at all. Despite the actors doing an adequate to exemplary job, this remains Ravi Chopra's personal vision. One feels that he is completely in control of the proceedings of the second half, and he tells it with understated finesse. Despite some clunky dialog and orthodox thinking, the film continues along a brisk pace, and Chopra tells his story as he wants to. But the preamble to his story is a large and unwieldy first half, which, though light in tone, is heavy in size. Chopra has loose control over it, and it shows. One wishes he could have told his story in a smaller, tighter duration. This is truly not a film for people with a modern, progressive bent of mind, and definitely not made with the young generation in mind. It's a film made for the more traditional generation or social class, and even so, while may not be terribly effective, it is sufficiently well-crafted with some stellar performances by Amitabh and Rani. Despite being the obvious thing to say, I don't think that the film is regressive at all. It's simply old-fashioned. Be the first to comment on Baabul! Just use the simple form below. fullhyd.com has 700,000+ monthly visits. Tell Hyderabad what you feel about Baabul!